San Francisco Mission location, near 24th/Mission. Email earthviewmusic@yahoo.com for location and directions. Local Burma expert Rick Heizman has been to Burma 20 times—and is going again in early October—for the third time this year. Rick will give a short dynamic presentation and answer questions about the mega-disaster and his related work. 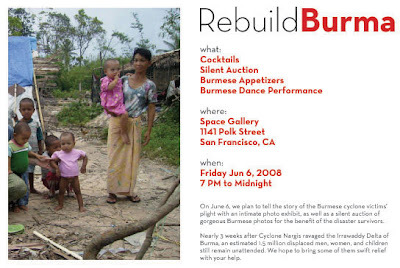 Rick will be raising funds to rebuild and repair schools and orphanages, sponsor and facilitate art and music therapy for traumatized kids, and help people reestablish their livelihoods and help kids regain a hopeful childhood. 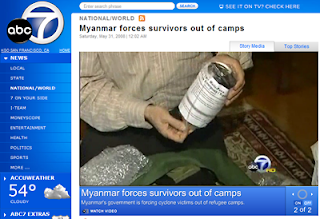 The non-profit advocacy group, Ethical Traveler, has revived their Candles for Burma campaign. 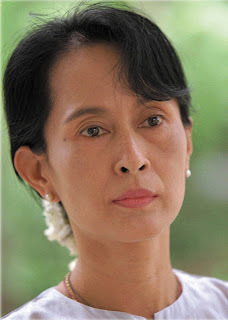 This campaign - wherein visitors to the ET web site can post images in solidarity with the people of Burma - originally ran for Aung San Suu Kyi's 60th birthday. 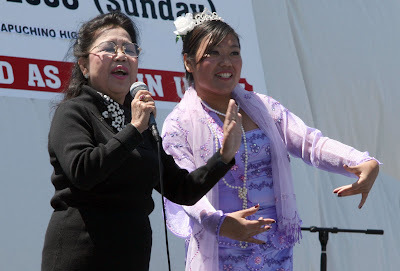 Now, three years later, the campaign is being revived to draw attention to all prisoners of conscience in Burma (including Aung San Suu Kyi) and to show solidarity with the victims of Cyclone Nargis. 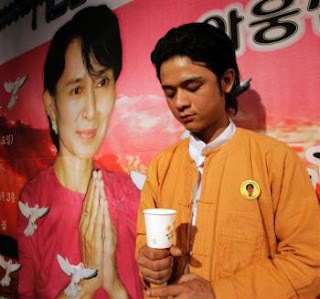 Show your solidarity with Aung San Suu Kyi and all the prisoners of conscience in Burma. 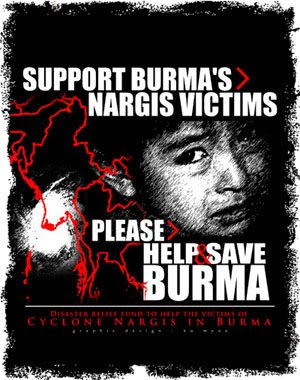 Show your solidarity with the victims of Cyclone Nargis. Dennis Bernstein updated his listeners on the post-cyclone situation with the help of Kenneth, Nandi, and Nick (just back from Burma). 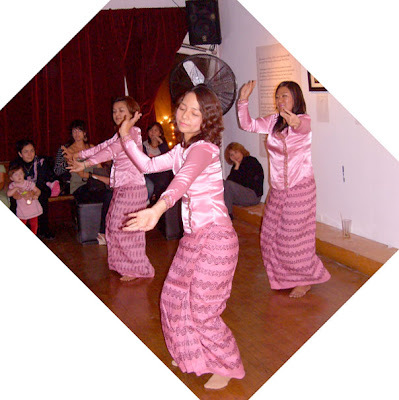 The events on June 14 and 15 were both very successful. View photos from each by following the links below. 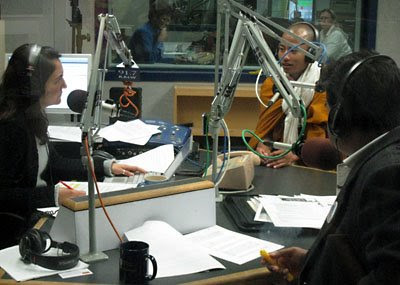 Viji Sundaram's interview with U Pannya Vamsa during his recent Bay Area visit. 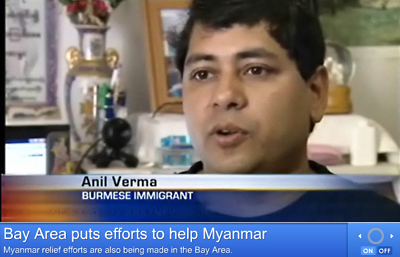 Editor's Note: Chairman of the International Burmese Monks Organization - 81-year-old U Pannya Vamsa - speaks to New America Media about the way Burmese monks are organizing to give aid to cyclone victims in Burma. Viji Sundaram is an editor for New America Media. 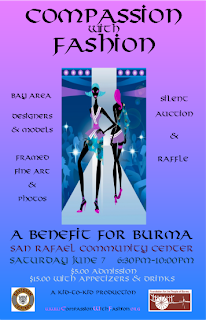 The Compassion With Fashion fund-raising event was held on Saturday, June 7. 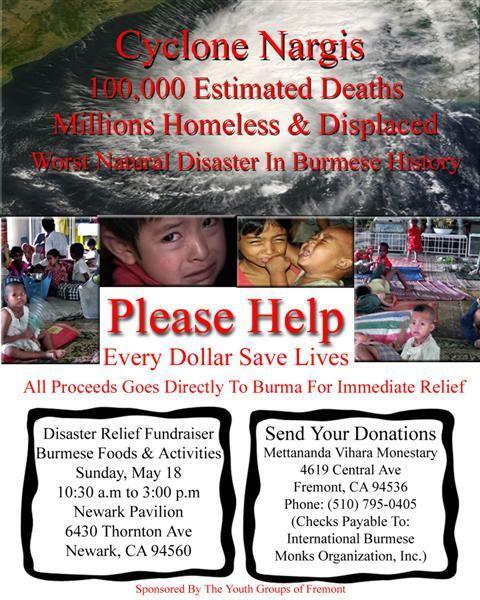 The June 6 fund-raiser was well attended and about $1500 was raised for cyclone relief efforts. Recent coverage on Flashpoints, hosted by Dennis Bernstein, includes the following two radio shows. 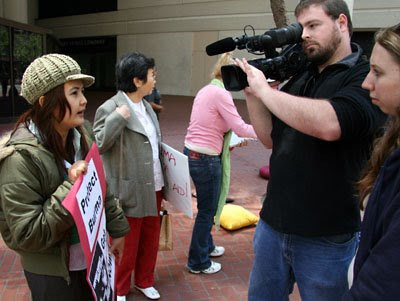 Flashpoints airs each weekday from 5:00-6:00pm on KPFA FM in Berkeley (and online). 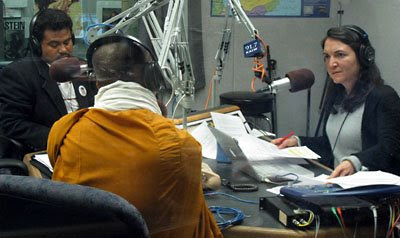 Tune in Tuesday, June 3, as Dennis will have guests calling in with first hand reports from inside Burma. 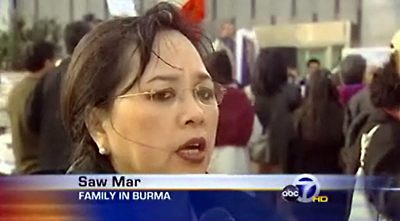 On May 5, members of the Burmese Community in the San Francisco Bay Area responded to news of the devastating Cyclone Nargis in Burma by forming a Joint Action Committee. Just two days later, individuals and representatives of some 27 organizations came together for the first meeting of the JAC. At that meeting it was decided to initiate fund raising on multiple fronts and to channel relief funds via the International Burmese Monks Organization (IBMO) - aka Sasana Moli. Because the ruling junta in Burma has shown that it can't be trusted to channel assistance to those in need, donor contributions have paled in comparison with those for the recent earthquake in Sichuan, China. 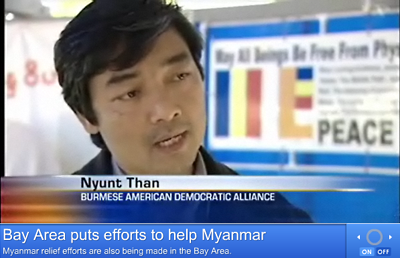 Some 2.5 million lives are at stake in Burma. The Burmese monks are trusted by the people and they are not waiting for permission from the junta to bring critically needed assistance to the cyclone survivors. 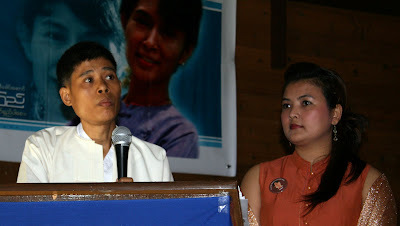 The IBMO was formed last October following the brutal crackdown of peaceful demonstrators in Burma the previous month. 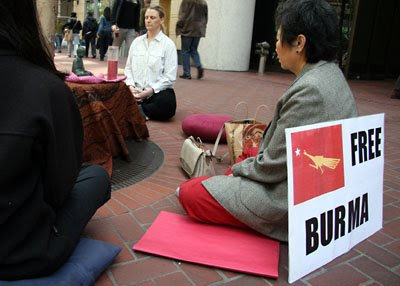 Burmese monks living in exile around the world came together in Los Angeles and formed the organization to raise international awareness of Burma's situation and to lobby international governments. Venerable U Pannya Vamsa - co-founder and Chairman of the IBMO who makes his home in Penang, Malaysia - will be in the San Francisco Bay Area this weekend. 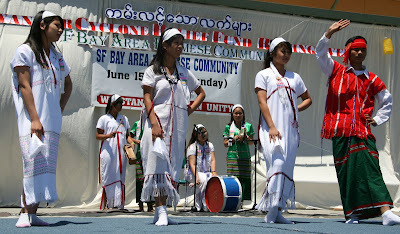 U Pannya Vamsa has been on an international tour, urging the global public to join the ongoing struggle for Burma. 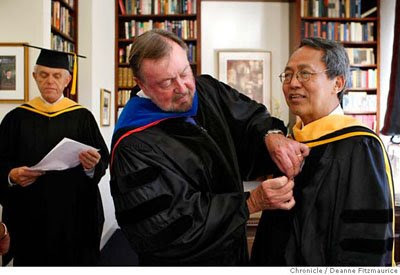 For over 50 years, he has tirelessly worked to establish Buddhist centers around the world. He has now taken up the responsibility to raise funds for the victims of cyclone Nargis and to ensure efficient distribution of the collected donations. We encourage everyone to take advantage of this rare opportunity to hear a sermon by the abbot. In the aftermath of cyclone Nargis, a 165 MPH monster that ripped through Burma's Irrawaddy Delta and turned much of the fertile region into a waste land, green-clad soldiers from the Tatmadaw (the Burmese Army) are nowhere to be found. Instead, maroon-robbed Buddhist monks emerge as the heroes leading the rescue and recovery effort. 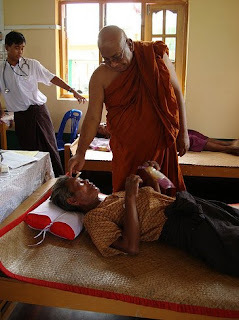 A flickr photo album from an anonymous user named Cyclone Nargis shows the efforts of Sitagu Sayadaw (the Abbot of Sitagu Monastery) to bring relief to the survivors. Rangoon University, already suffering from neglect since the student-led uprising in 1988. now resembles a jungle. The congregation hall still stands, but surrounded by abandoned lecture halls and uprooted trees. A Picasa photo stream by MoeMaka shows the devastation. Another Picasa photo stream (warning: contains disturbing images) by Salai Than shows a closer look at the human toll and the devastation to the land. As president of the IBMO, Venerable U Pannya Vamsa has been on an international tour, urging the global public to join the ongoing struggle for Burma. 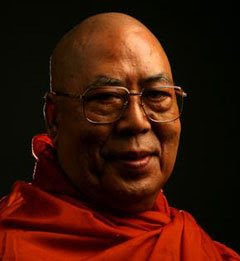 For over 50 years, he has tirelessly worked to establish Buddhist centers and spread the Dharma around the world. He has now taken up the responsibility to raise funds for the victims of cyclone Nargis and to ensure efficient distribution of the collected donations. 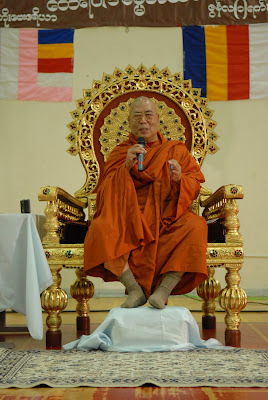 We encourage everyone devoted to Buddha's teachings, the survival of Buddhism, and the cause of the cyclone victims to take advantage of this rare opportunity to hear a sermon by the abbot. 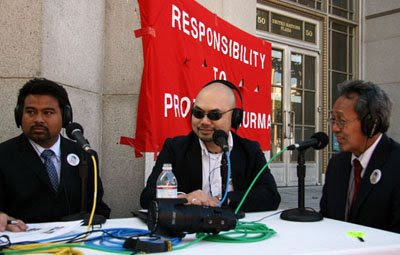 Tune in to KALW 91.7 FM Tuesday, May 20 at 9:00pm PST, for a special Trans-Pacific edition of the Your Call radio program, as they look at the situation in Burma. How have the disastrous cyclone and the slow response of the military government changed the prospects for democracy in Burma? Will be in San Francisco! (05-13) 04:00 PDT Kyi Bui Khaw, Burma -- The saffron-robed monks who spearheaded a bloody uprising last fall against Burma's military rulers are back on the front lines, this time providing food, shelter and spiritual solace to cyclone victims. The military regime has moved to curb the Buddhist clerics' efforts, even as it fails to deliver adequate aid itself. Authorities have given some monasteries deadlines to clear out refugees, many of whom have no homes to return to, monks and survivors say. "There is no aid. We haven't seen anyone from the government," said U Pinyatale, the 45-year-old abbot of the Kyi Bui Khaw monastery sharing almost depleted rice stocks and precious rainwater with some 100 homeless villagers huddled within its battered compound. Similar scenes are being repeated in other areas of the Irrawaddy delta and Rangoon, the country's largest city, where monasteries became havens after Cyclone Nargis struck May 3 - and the regime did little. "In the past I used to give donations to the monks. But now it's the other way around. It's the monks helping us," said Aung Khaw, a 38-year-old construction worker who took his wife and young daughter to a monastery in the Rangoon suburb of Hlaingtharyar after the roof of his flimsy house was blown away and its bamboo walls collapsed. One of the monastery's senior monks said he tried to argue with military officials who ordered the more than 100 refugees to leave. "I don't know where they will go. But that was the order," he said, asking for anonymity for fear of reprisals. The government has not announced such an order, which appeared to be applied selectively. Other monasteries in Rangoon have been told to clear out cyclone victims in coming days, the monk said, but in the delta, refugees were being allowed to remain or told they could come to monasteries for supplies but not shelter. "They don't want too many people gathering in small towns," said Hla Khay, a delta boat operator. The regime "is concerned about security. With lots of frustrated people together, there may be another uprising." Larger monasteries were being closely watched by troops and plainclothes security men - "invisible spies" as one monk called them. Such diversion of manpower at a time when some 1.5 million people are at risk from disease and starvation reflects the regime's fear of a replay of last September, when monks led pro-democracy demonstrations that were brutally suppressed. Monks were shot, beaten and imprisoned, igniting anger among ordinary citizens in this devoutly Buddhist country. An unknown number remain behind bars, and others have yet to return to their monasteries after fleeing for fear of arrest. "I think after the September protests, the government is afraid that if people live with the monks in the monasteries, the monks might persuade them to participate in demonstrations again," said a dentist in Rangoon, who also asked that his name not be used for fear of reprisals. Newspapers have been ordered not to publish stories about monks aiding the people, and at least one monastery and one nunnery in Rangoon were prohibited from accepting any supplies from relief organizations. "The government is very controlling," said U Pinyatale, the abbot at the Kyi Bui Khaw monastery. "Those who want to give directly to the victims get into trouble. They have to give to the government or do it secretly. (The military) follows international aid trucks everywhere. They don't want others to take credit." It appears unlikely that foreign aid organizations seeking to enter Burma will be allowed to use monks as conduits for relief supplies as many had hoped. "One of the best networks already in place in the country are the monks," said Gary Walker of PLAN, a British relief group, speaking from Bangkok. Cyclone coverage with Bay Area guests. 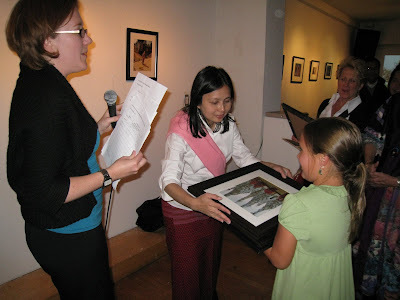 Photos and report - just came in from Yangon - from a school project that I help in a distant suburb of Yangon. Below the photos, read the report by the man who started and runs several schools like this. I've been in touch with people in Yangon for three days now, and am getting these kinds of photos and reports about the various projects that I am involved with, and I have assigned some of my contacts there to document other damage and needs as they find them. 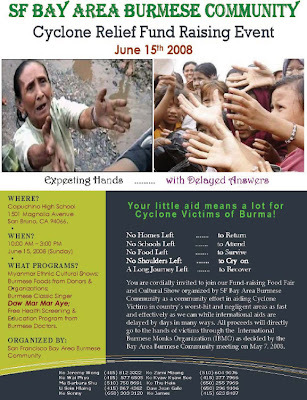 I'll be there in 3 weeks aiding these and many needs - and with your help we can make a difference. Internet wasn't working for a couple of days and electricity isn't available nor will it be for a good while. There is lack of water for drinking, bathing etc, in the case of the school we are fortunate to have a water filter and a diesel engine with enough fuel to supply for cooking and drinking. Also we have a treadle pump by the dug well which enables people to take bath and wash clothes. Many people carry water from afar and boiling water is increasingly difficult with the rain soaking the environment and the markets short of supplies, and of course no electricity is available. In Thanlyin our daycare school which was opened in January this year was completely demolished and our kitchen was also thoroughly blown apart. The only building which remains is our wooden preschool. I was staying in the school on the night of the cyclone. The howling went on all night and the force increased around break of dawn. I could barely make my way out, but realized the need for securing cooking possibilities and rescued the stove and gas cylinder to cook in the preschool which now also house our daycare children. Five families sleep in the school since their houses have been destroyed and we provide food to them as well as all children in daycare. Other village children from families in extreme need come twice a day for a meal. Ayawaddy division and Yangon are among the hardest hit areas and these are also the areas that produce most of the rice in Myanmar. The crops in the paddy fields have gone lost and prices already soaring in the markets might continue to be shockingly high creating need for further feeding initiatives. The price of rice has risen drastically, reportedly up to 3 times the normal price and the local markets are running out of stock. The first thing I did after the winds had calmed down was to pull a trolley to the local market two bus stops down the road in order to bring some emergency provisions back to school. Every 50 meters fallen trees blocked the road and no transport could use the roads for several days, still transport is comparatively limited in many parts of the suburbs of Yangon, fuel is costly and supplies are scarce. Thick trees, traffic lights, roofing materials, broken walls and fallen signboards still obstructed the way when I made it in to Yangon several days after the cyclone passed. And people still lack water and electricity. Without electricity they cannot pump water. Some diesel engines are pulled around on carts to be used for pumping water by households paying for the service. From ground level people hand buckets up the stairways to their apartments. Prices on roofing, nails and other construction materials have gone up considerably. Incidentally I was in the school at the time of the cyclone; otherwise it wouldn't have been possible for me to reach there by any means of transport. Nobody here was prepared since information on the caliber of the approaching winds hadn't been available. The destruction has been massive. Enormous trees of 200 years or more are witnesses that this was an incident without a second in the recent history of Myanmar. Lacking any good source of information it is difficult to get an overview of the disaster but in the villages around Thanlyin about 80% of the houses have been damaged and 50% severely broken or completely demolished. Walking in the debris of the villages 4 days ago we took another 7 children below 2.5 years into immediate care in our school, providing medicines, food and a safe space while their parents try to patch together something of a home to shelter them from the rains. And naturally there are more children to respond to, we look to the youngest first and those without enough parental support or those in ill health. We will make efforts to continue to keep these children in our daycare since we understand that their families had a hard time making a living already before the cyclone struck and now conditions are even worse. We hope to receive enough support to reconstruct the daycare school and to help the most needy families in our area to rebuild their homes. 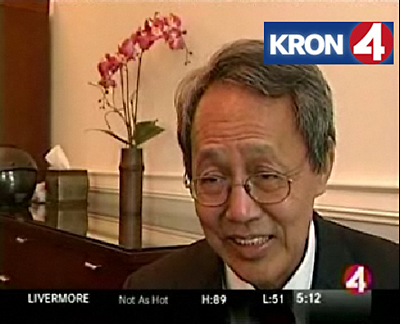 SAN FRANCISCO, CA (KGO) -- A deadly stalemate continues Friday in Southeast Asia. The military rulers of Myanmar continue to refuse most foreign aid in the wake of last weekend's cyclone. With hundreds of thousands of people desperate for relief supplies, the critical issue is whether the government will allow many of them to die. 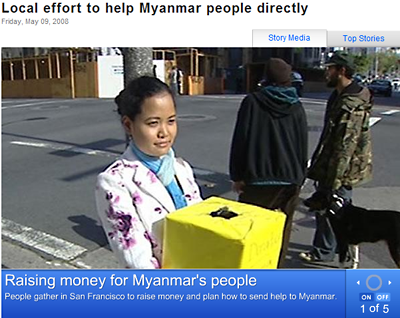 Friday night people gathered in San Francisco to bypass the Myanmar Government, and send help straight to the survivors. "Where do we want the aid? In Burma. When do we want it? Now," chants the crowd.